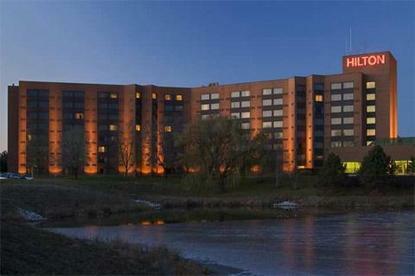 The Hilton Lisle/Naperville hotel in Lisle, Illinois features beautifully appointed and elegant hotel rooms. The Hilton hotel near Naperville, Illinois offers several elegant meeting, banquet and wedding reception ballrooms, as well as world class cuisine/catering for your next meeting, family reunion, wedding, romance package or a family weekend getaway.Just West of Chicago, this Hilton hotel in the Lisle/Naperville, Illinois area offers something for everyone. Convenient to Downtown Chicago, Illinois and O'Hare (ORD) Airport, this Hilton Lisle/Naperville hotel is at I-88 and Naperville Road near the corporate offices of BP, IBM, Computer Associates, Lucent, Aramark and MetLife.The Hilton Lisle/Naperville hotel near Chicago, Illinois has the conference center and banquet facility to meet all your personal and group needs:Special Occasion: * Wedding Reception* Bridal/Baby Shower* Birthday* AnniversaryCorporate or Business Meeting: * Training* Product Launch* Sales Meetings* Trade Show and Exhibits* University/School/College SeminarSocial: * Prom/Cotillion* Family/Military/Class Reunion * Corporate/Family Holiday PartyBus Tour and Motor Coach: * Sports Teams* Leisure* Student* SeniorThe Hilton Lisle/Naperville hotel offers complimentary shuttle service to local area companies and Metra train station. Visit nearby attractions such as the Morton Arboretum, Chicagoland Speedway, Chicago Premium Outlets Mall, and the Naperville Riverwalk. Award-winning cuisine and extraordinary atmosphere await you in Allgauer's restaurant located in this Chicago/Naperville area Hilton hotel, open daily for breakfast, lunch and dinner and a spectacular Sunday Brunch.Travel should take you places.